This is a municipal park. Yes, it looks like untamed prairie…and it actually is. But it’s still a municipal park. It’s a park inside a city — Calgary. 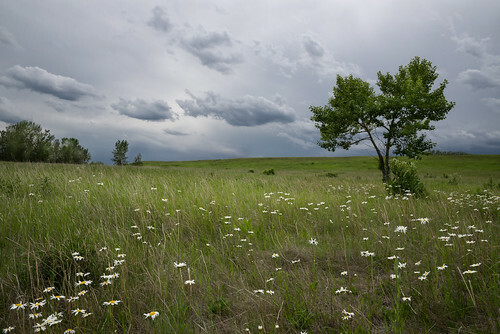 Four square miles of native grassland, home to almost 200 different species of wildlife, Nose Hill Park is probably the only municipal park in the entire world where porcupine live wild. It almost didn’t happen. Back in the early 1970s, developers wanted to build a ‘residential community’ here. Ordinary people organized, though, and convinced the city to not only stop the development, but also to buy the land and turn it into a park. Today Nose Hill Park is surrounded by a dozen different residential communities, but deer still wander through the aspen groves, gophers dodge hungry harriers in the oatgrass, and porcupines waddle along the edges of the coulees in search of tender roots and berries. All inside the city of Calgary.